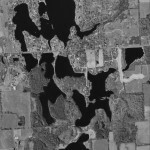 Lake Manitou is a 73-acre reservoir all-sports lake located in Shiawassee County, Bennington Township, Michigan, 6 miles south of Owosso, 6 miles north of Perry, 1 mile east of M-52 and 1 mile west of Morrice Roads. West Garrison road borders the lake to the south, Kiwanis Acres borders the lake to the north with Waugh Road to the west. Lake Manitou is the largest and only lake with a bonified association of a group of private lakes in the area that include: Springbrook, Fawn, Bambi, Eve, Forrest, Mirror & Bear. Lake Manitou Association consists of 102 single family homes, 15 vacant lots, 6 ingress-egress access lots, and a common boat launch for Association residents only. Lake Manitou Association is incorporated as a non-profit governed by an elected Board of Directors and Association By-Laws. The lake provides enjoyment to fishermen, power boaters, water skiers, tubers, jet skiers, wake boarders, paddle boaters, swimmers, pontooners, and a sail boater or two. Winter activities include ice fishing, ice skating, cross-county skiing, snowmobiling, and the occasional neighborhood snowball fight. Lake access is limited to Lake Manitou Association Members and invited guests. All watercraft must be owned and registered to property owners of the Association and the watercraft shall display an official Lake Manitou emblem on the starboard bow (front right side). Hunting of animals and waterfowl is prohibited. Lake Manitou was a marshy valley of thick underbrush and high swale grass in 1959 when Murl Duffey persuaded Jack Smith to buy the land with the dream of turning the valley into a lake. 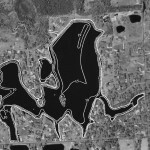 By Spring 1960, eighty acres of land became submerged. Lake Manitou Association was originally incorporated on August 12, 1964 as the Lake Manitou Residents Association and was renamed to the Lake Manitou Association on December 15, 1973. The Association is governed by a set of By-Laws and a Board of Directors. 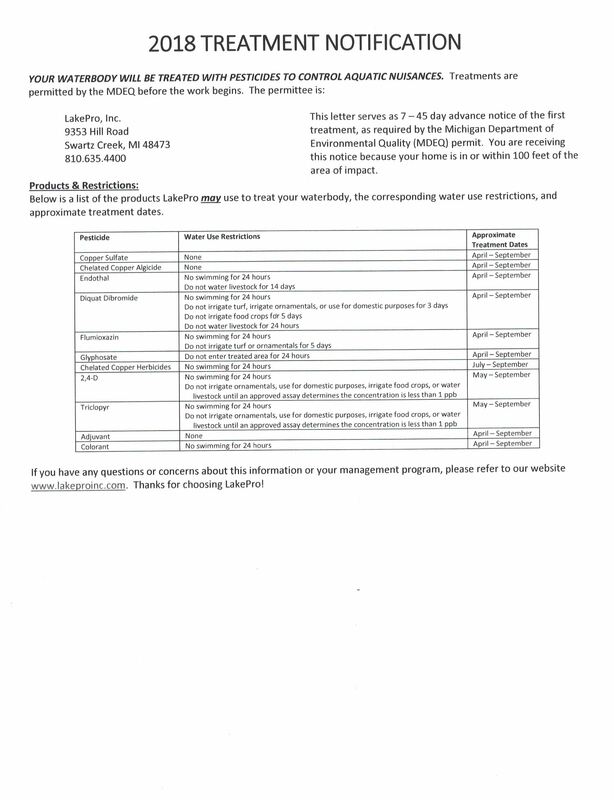 The Association assesses annual dues payments to finance lake and common area maintenance. For more information, click hyperlink -> History, or click “About Us” from the main menu at the top of this page and select “History”. Lake Manitou is a manufactured private lake situated amidst Sections 10 & 11, Bennington Township (T6N R2E), Shiawassee County, Michigan. The lake has a maximum depth of 19 feet and a mean depth of 11.1 feet. The lake is 781 feet above sea level. Its outflow goes to Springbrook stream, then to the Maple River and onward to the Grand River basin.